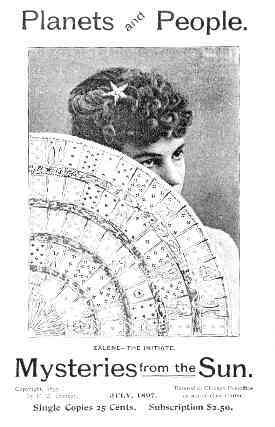 From the very beginning, at spirit circles, unusual physical phenomena were “manifested.” Spirits communicated not just by planting ideas or visions into the minds of mediums, but by making rapping sounds, or by taking direct bodily control of the mediums and conveying messages of comfort, admonition, and elevation, acted out in impromptu representations. At Harmony Hall in Boston during the mid 1850s, spiritualists attended lively discussions once a week. 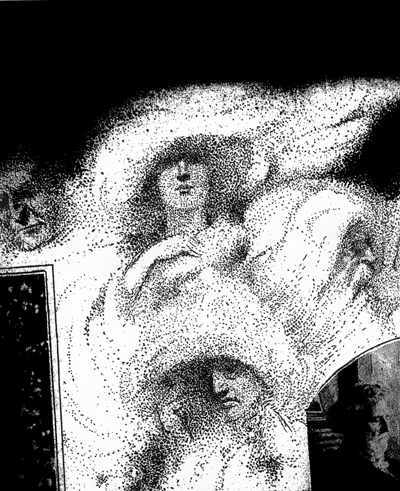 Since some of the spiritualists were mediums, the spirits would often interject comments spontaneously into the discussions, so that “both those in and out of the mortal body were active participants, conversing freely together even as if all were still in the physical form.” The sessions evolved, “mainly under the control of our invisible company,” into regular “dramatic presentations,” in which several mediums would be brought under trance control of spirits, who then used them as actors “personating” characters in skits that were improvised on the spot and guided by the unseen directors, and that “often possessed a moral point and power seldom equalled in the pulpit; whilst in interest, they were scarcely inferior to some of the best of our popular theatrics.” Many were satires on the “formulistic religion and deformed theology of the so-called christian church,” where one entranced participant might represent “some ‘Evangelical’ minister, or deacon of the old school” and another might represent “an angelic spirit” gently gliding in and around the members of the audience with appropriate “words of love and wisdom.” [Ex-Clericus [pseud. of Herman Snow], “Life with the Spirits,” Religio-Philosophical Journal, March 13 and April 10, 1880]. 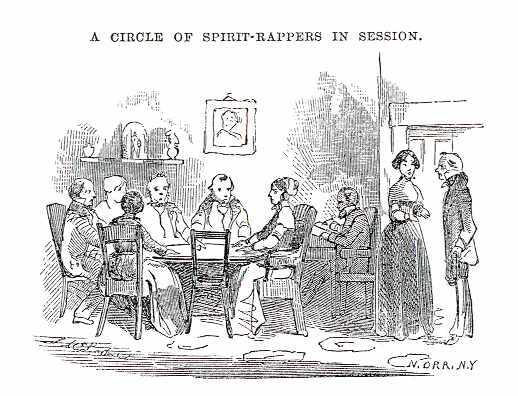 From the first spirit circles conducted by the Fox Sisters, spiritualism also included more scientifically dubious phenomena—tables would tip and trip across the room and sitters would levitate. These phenomena had been present in some of the mesmeric “experiments” beginning in the late 1830s, and were attributed then to the sitters’ manipulation of the aetheric electricity or magnetism, but after the “new dispensation” of spirit communication, they were regarded as a sign and effect of spirits. Soon, other “manifestations” became common at séances—flowers or coins would fall from nowhere onto a table, balls of light would come to life and skitter about the room, guitars or horns or drums would float into the air and play tunes by themselves, and pencils or brushes would write messages on slate boards or on folded paper inside sealed envelopes. Not long afterwards, enterprising folks across America began to construct “spirit rooms” where visitors could regularly encounter demonstrations of spirits enlivening dead matter—floating pistols firing in the dim light, levitating instrumental bands ringing changes on “Old Dan Tucker,” and mediums—standing in front of a seated crowd, not joined in a seated circle—“personating” (being possessed by the spirit of) famous and infamous characters—patriots, scientists, pirates, Indian guides. Many of the visitors, all charged an admission “donation,” were genuine pilgrims and seekers, and many were deep skeptics, but some appear to have gone simply for the thrill, as people today visit amusement parks. The most famous of these many “spirit rooms” were built and conducted by the Jonathan Koons and John Tippie families in Athens, Ohio, and, later, the Keeler family in Monrovia, New York, and the Eddy family in Chittenden, Vermont. 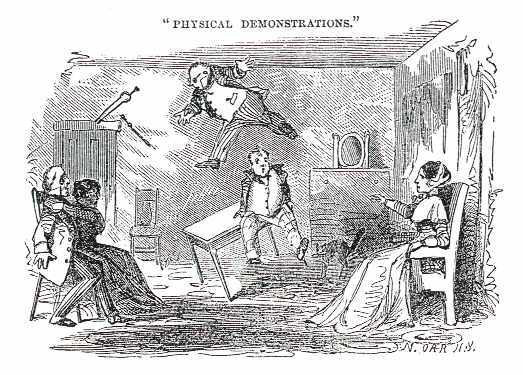 Over the two decades from the mid 1850s, these “demonstrations” of spirit presence and power became progressively more elaborate and “tricky,” including, for example, telepathic displays and psychometric readings of messages inside sealed envelopes. 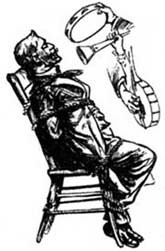 The trend was set by a pair of young brothers, Ira and William Davenport from Buffalo, who toured under the management of their father, a retired police officer, and demonstrated “manifestations,” such as the mysterious untying of rope bindings—or the escape from secure bindings—which, if presented in another context, would have been received as stage magic. The Davenports’ performances also reinforced a trend toward demonstrating “materializations” (as opposed to mere “manifestations”). In the Davenports’ “dark séances,” phosphorescent hands appeared from behind curtains or from within their specially constructed “spirit cabinet” (in which one of them, entranced, had been locked). The hands sometimes floated free among the sitters at the séance table, caressing their necks or undoing young ladies’ hair combs. Spiritualism took from religion the imperative to “try the spirits” as part of what might be called the ritual of the séance, and took from science the imperative to subject its phenomena to “experimental investigation,” which invited attempts to falsify the hypothesis of spirit agency. This eventually pushed many public séances into “proof tests” where the medium was challenged to demonstrate the reality of the phenomena and the members of the audience were implicitly challenged to expose any trick they might detect. After a few verses of singing by the audience, a form, that of a man, was seen to emerge from between the curtains. Several gentlemen among the audience were called upon to approach the platform and to shake hands with the spirit-form, which was recognized by them all as that of Allen J. Putnam, a veteran Spiritualist, well-known in Boston, who had passed on to the higher life on the previous Friday. Before his transition he had promised some friends that he would, if possible, materialize at their public séance, and he was able to keep his word. He repeatedly appeared and joined with the audience in clapping hands. In the decades after the Civil War, many spiritualists began to elevate the goal of materializing spirits, and, in particular, materializing the “full body” of spirits, as the ultimate in mediumistic achievement. Such materialized spirits would typically be expected to appear, in pale or gauzy attire, from the twilight or darkness during a cabinet séance, and roam around the room, where they would be recognized by members of the audience as the spirits of the deceased. With such expectations, the potential for elaborate fraud was great. As séance conditions came more and more closely to resemble performances of stage magic, a number of well-publicized exposures occurred of the fraudulent methods of some of the more spectacular and successful mediums, such as Henry Gordon and Henry Slade, whose performances relied on extravagant displays of “phenomena,” as they were called. A new sort of medium has appeared here in the spiritualist world. This one claims to be the re-incarnation of the dead, asserting that while in a trance state she (for the medium is a woman) is possessed of the spirit of the dear departed. Accordingly she proceeds to act as the dead would if alive, which is usually in quite an affectionate manner toward near relatives. While the audience is sitting expectantly before the mysterious cabinet, the medium, clad in a loose robe, comes forth like one walking in sleep, and begins demonstrations of affection which she claims are entirely unconscious on her part, being utterly forgotten on her recovery from the trance. There is likely to be scandal in the spiritualistic circles. —Landmark (Statesville, North Carolina), November 25, 1886. By the 1880s, earnest spiritualists and mediums concerned with the damage to spiritualism being wrought by fraudulent “mountebanks,” carried out more and more exposures. They sometimes joined forces with amateur detectives, police investigators, and professional magicians (such as Harry Kellar) in order to do this. At this time, many spiritualists took upon themselves the task of re-focusing spiritualism away from the wilder and more uncontrolled expressions of mediumship, and toward the more reasonable, progressive, rational, and philosophical side of the movement. It was time, they said, to look more to the spiritualist lecturers, writers, and thinkers to guide the movement, and less to the young, untutored, and sensation-seeking mediums. It was time, they said, to solidify an organizational structure to bring spiritualism out of the dark and private closet and into the light of the public meetinghouse, into spiritualist churches and lyceums. They contrasted the later séances, with their emphasis on “phenomenalism,” with séances in the earlier days of spiritualism. Earlier “manifestations” were spontaneous, unpredictable, and required little or no equipment. They were unroutinized and done at home (mostly, or at least not on a stage) and in full or only partially dimmed light. They were part of a larger effort of uplift and comfort, with the expectation that they were the expression of a rational philosophy. They had consequences that led the participants toward a general program of liberalization and social reform. They were not primarily focused on pure sensation, but were directed toward the “higher faculties” of feeling and intellect. Payment was not expected by the medium, who was often a member of the group and not an outside professional. The growing emphasis on “full-body materialization” paralleled the increased speculation in the spiritualist community over the possibility of the spirits participating in the reproductive elevation of the human race through breeding a new order of beings. The noble spirits of the past—representing, one might say, the highest expression of the race, or its racial memory—would “promiscuously” concentrate themselves in a mediumistically-sensitive, expectant mother and manifest themselves again in the material world, in the exalted characteristics of her newborn, solving the old problem of spiritual “re-generation.” In the cabinet séance, the medium became entranced (and thus indisposed) and was in seclusion inside the dark cabinet. From that dark cabinet, she gave birth to a thrilling spirit version of herself (disguises were often so flimsy as to be more suggestive than convincing), who was at liberty to mix with and tantalize the members of her audience. The audience members’ Victorian unconscious, it seems, must have known the true identity of the spirit, but appeared to struggle against their collective suspension of disbelief, through a kind of implicit Peter Pan plea to help the spirit through declaring their belief in her identity. Many cabinet séances, as well as their exposures, had a strong sexual undertone. Accounts read like a Victorian romance novel: young women mediums flimflamming old widowers and ruining them, by taking their money as well as their reputations. Young men defending the materialized spirit forms from being “exposed” by having their gauzy robes snatched from them, revealing the “voluptuous” forms of the mediums to the gaze of the audience. The contemporary readers of accounts of exposures apparently assumed that women mediums, if revealed to be deceivers in regard to materializations, were also “fast” in their sexual behavior. Those opposed to the fascination with “ultra-phenomenalism” and the consequent frauds to which it led spoke of the need to certify or license or even ordain mediums and lecturers (partly to protect genuine spiritualism from its counterfeit, and partly to protect individual mediums and lecturers from prosecution as frauds under local ordinances). Other spiritualists countered by portraying these proposals as the interference of a fossilized “priesthood,” trying to take away the living oracular unpredictability and liberty of the spirits and the play of the mind of the mediums, and confine them under the authority of a hierarchy, an ecclesiastical dogma, and to shut them up inside churches. They argued that the foundation of spiritualism was completely dependent on physical manifestations and “phenomena”—otherwise, spiritualism was no different from vague romanticism, mere “inspirational uplift,” or traditional religion (which disallowed “gifts of the Holy Spirit” after the end of the Apostolic Age). The pursuit of materialization, they said, was necessary for the “marriage of religion and science,” as the revelation of the truth of the spiritual world’s presence in the material world. And finally, since most mediums were female, and many of the self-styled respectable spiritualist lecturers were male, mediums and their sympathizers argued that any attempt to bring mediums under the control of the lecturers and philosophers and organizationists of the movement was merely a repetition of the same persecuting attitude behind the male medical establishment’s attempts to drive unlicensed, and largely female, alternative practitioners and midwives out of the healing business. Many spiritualists opposed the unmasking of mediums—they saw it as a form of persecution whose effects would necessarily spread out against all mediums, and would give aid and comfort to their anti-spiritualist enemies.